Eden arrived last summer after her short showing career ended when she didn’t meet the size needed to compete successfully. Being undersize, despite coming from excellent stock, also meant Eden was not a candidate to breed from. We welcomed Eden here to spend her retirement with Cloud’s group. Cloud had no leading lady and it wasn’t long before Eden had assumed that role and quietly but confidently became Cloud’s top sow. Over the last few weeks Eden had lost a little weight making her dewlap look more pronounced, I thought. Soon it was clear that it was a swelling, not her dewlap as such and Jenny confirmed that she either had a heart problem or infection, likely an infection as she was still only two. Jasmine (gift from god) has left us to become a Star on Planet Guinea, she is the big, chunky, bright shiny star that is usually in the same place and chooses not to move around. When she does move it is in direct straight lines that reach their destination quickly. Jasmine was around 5 andcame to Planet Guinea as part of the Satin Study along with Cooper and Rosa when she was about 2. A big chunky sow, she didn’t develop signs of what may have been Osteodystrophy until the last few months of her life- however her mouth has always been ‘perfect’ pointing to the fact that it may not have been Osteodystrophy at all. Jasmine was a favourite at the local primary school where she visited several times and was a ‘guinea pig’ for a local vet visiting the school. 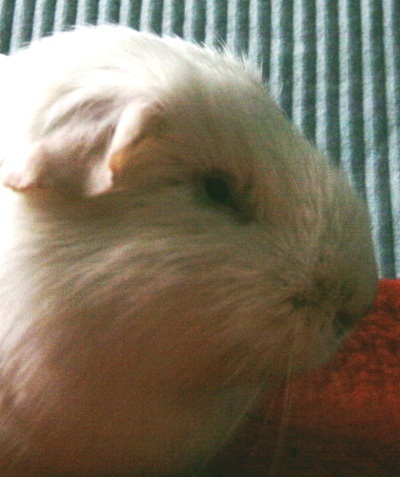 Jasmine also attended Piggy PMs where she was a favourite with lots of people in the guinea pig room. The snow and extreme weather is definitely having an impact here and forcing some trains of thought never considered before but today forced me to do something I would ordinarily have asked Jenny (vet) to do. Whilst it is possible to walk up the hill on the icy and dangerous pavements to the vets there would probably be no one there to do a dental, i.e. Jenny! Jenny is working at her local surgery as opposed to her normal one near Planet Guinea 😦 . Lily has been showing signs that she has dental problems this wheek, not unexpectedly, she has had ongoing problems since she arrived that Jenny has been treating, they start with loose pellets, and progress to slower and slower eating meaning she is almost continually grazing. On closer inspection her left lower Premolar was starting to curl over the tongue though wasn’t trapping it, yet. Doing dental work isn’t my most comfortable aspect of looking after the guineas but if needs must… Wrapped and supported on a cushion Lily was a good patient for me and further investigation revealed that the Premolar was not only overgrowing it was decaying and wobbly, great, now we have the added problem of pus and infection- maybe! However, the Premolar was suitably loose and easy enough to remove with no squeaking from Lily, no blood and no pus! Truth be told I feel quite proud of myself, the best part was seeing Lily eat with enthusiasm immediately after the extraction, I couldn’t help but think “that’s all because of me”. Similarly I could have needed to trim her Molars and it could have caused misalignment and further problems, also “all because of me”. I am just thankful I had some training from Gina ( an experienced rodentologist) on dental work and decided to buy the necessary instruments. Whilst I’m happy to do Incisors I still find the Molars a challenge but when push comes to shove it’s suprising what a snowfall can force you into. Lily ate some banana and then celery followed by carrot before going back with the others where she tucked into into some Bunny Nature fine Alpine hay and Just Grass. Lily knows that when my wellies are in the pen food will follow and she climbs up them in anticipation. Watching her search for the bowls can be amusing, if she doesn’t find what she wants she simply carries on “looking” and wheeking, like I’ve forgotten to put what she wants in there! You’re cute Lily but I know what’s good for you! After establishing (through total lack of reaction) that Lily is likely to be totally deaf I booked her in for a general health check with Jenny, my vet. Lily also had issues with her Incisors slanting (suggesting there was a problem with the Molars). She took the ride to the vets in her stride and by the time we got there her and Miss Lucky had devoured everything I had given them. Little Miss Lucky came along for her second course of Chorulon injections and was first out of the travelling box, but Lily had other ideas and tried to follow. After Little Miss Lucky’s checkover Lily came out, she had her eyesd tested for any reaction to light, although both eyes are shrunken the ‘eye area’ is big and the lids are not pulled tight. There was some reaction in her right eye but none in the left. 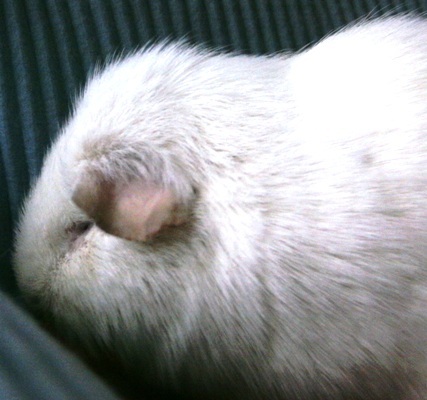 Nothing is known about the sight of a ‘normal guinea pig’ so any diagnosis is comparable. It’s thought Lily can probably see shape, dark and light; this fits in with her movements at home which are clumsy if she moves fast but fine when moving slowly. On arrival Lily would sit in the dark hardly venturing out even to eat. After trying out the maze Jenny concluded that sight in Lily’s left eye was very poor or non existent. Her left eye did, however have an infection in (which was obvious by the smell coming from it when she arrived), Cloud and the girls have been cleaning it for her and the smell has lessened a lot, nevertheless Lily is having Fucithalmic viscous drops. There isn’t a test for hearing and that’s one thing that Lily doesn’t react to- sound, but she will respond to vibrations and is quite sensitive to them. Her teeth were filed and trimmed where necessary, her Molars were uneven and she will be going back to have them looked at. Apart from that there was no soreness or other issues. Essential Oil Therapy for Animals was suggested as possibly being beneficial for Lily and with Jennys help we are looking into it. Lily has also had her first bath here and was a little unnerved at first (unusual for Lily, she doesn’t do reaction) but it wasn’t long before she was relaxed and seemingly enjoying the whole experience. Everyday I am getting a ‘wheek’ from her and she does try to come forward for food, even if sometimes she goes to the wrong side of the pen, she stands and waits expectantly with her little pink nose in the air 🙂 Lily’s pen is an irregular shaped Cavy Cage with hutches on 2 of the sides and Fiddlestix in. The first time I cleaned out I left everything the same but next time I purposely moved everything round and watched the reaction. Lily simply did a few laps of the pen and hutches to get her bearings (or make a mental mind map perhaps?) then carried on as before. If a Fiddlestix is in the way she climbs onto it, has a think about getting down and then takes a ‘leap of faith’, but I feel happier knowing she can cope with these objects than trying to wrap her up in cotton wool and remove everything- how boring would that be?! Lily has continued to be part of the group and is frequently caught snuggling with the others (not grooming them yet but hopefully she can reflect what she is being shown). Karen (who just wants a bit more out of life for Lily). Ursula, one of the Brightest and Biggest Stars. Ursula’s Humans contacted me in 2004 when they could no longer keep her and her friend. Although I was full up I was in contact with a Human that had a lone Senior pig who was looking for friends and Ursula and friend went to live with them. Three years later Ursula arrived here again, she was now the lone guinea looking for company; her Humans were moving and as devoted as they were thought it would be in Ursula’s best interests to stay in the Reading area. Ursula was now 6 years old, though a very spritely 6 year old, she went to live with one of my groups. After finding a broken tooth on Ursula, I noticed her breath was smelly when I was checking her mouth, although the regrowth of the new tooth was good it hadn’t been growing fast enough (should have been back to normal nearly) and it was wobbly- but not enough to come out. Ursula’s Incisor never did grow back, and she was over 8 and a half when she left us, she had minimal dental work done; for the most part filing but occasional trimming was needed. The word minimal and Ursula don’t go together, Urs was BIG in every way, a BIG prescence. Ursula also came along to Piggy PMs up until the age of 7 to show off her 3 Incisors and just how efficiently could eat with them 🙂 Ursula is also a calendar girl for Guinea Pig Welfare. Hope was undemanding but always stood her ground if she was challenged by anyone. 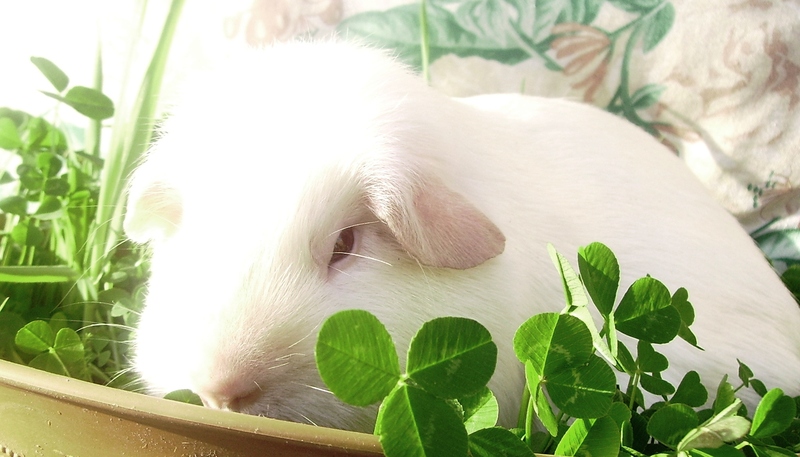 Lately she has been the model for the Planet Guinea Cereal Grasses, has been featured in calendars and has done some Piggy PMs. 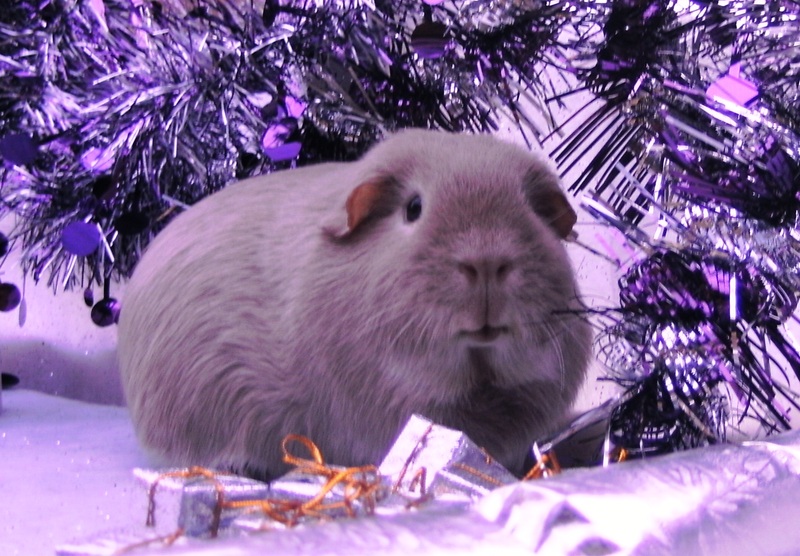 This wheek the very lovely Calista went to be a Star on Planet Guinea. 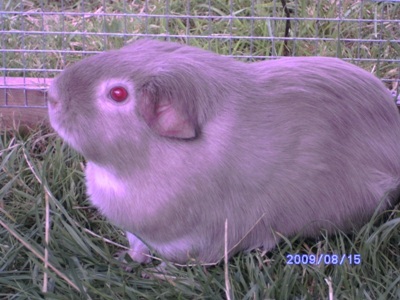 Calista was 5 and had been gifted to Planet guinea as part of the Satin Study (to establish whether or not Osteodystrophy is present in UK guineas), Calista’s breeder kept impeccable records and we could see if OD was likely to happen. Because such care had been taken when selecting Calista’s line it was thought that there was unlikely to be any OD in it, her ancestors had shown no signs (though OD can be carried) and her breeder was also the owner of several generations of pigs before her. Calista never showed any signs of OD, she did have some tooth root problems which she overcame. She had an horrific abscess and I was all for giving her every treatment available, however Jenny (our vet) calmly suggested we try the least invasive form of treatment first- antibiotics and flushing and go from there. Calista’s Incisors turned brown for nearly a year but they came back white and strong much to my suprise and she had no trouble after that. Calista went to Piggy PMs where she was a ‘guinea pig’ in the Vet Room, she helped in the demonstration on syringe feeding and giving tablets etc. Her quiet and calm manner made the vets and nurses look quite professional!